Make a splash on your tropical vacation as you enjoy a premium dolphin adventure before relishing an all-inclusive oceanfront experience. At Dolphinaris, you’ll meet a team of professional marine mammal trainers who will offer a safety orientation and informative animal behavior overview before you begin your encounter. Equipped with a mask, you’ll watch these friendly creatures swim underwater before engaging in some one-on-one interaction in the water. Hold tight as you ride atop a dolphin’s belly across the water’s surface and then pucker up as they plant a wet kiss on your cheek. After your swim, relax with a complimentary lunch buffet and unlimited refreshments. Your fun day in the sun also includes the use of kayaks, paddleboards, and snorkel gear to explore the park’s natural aquarium, home to tropical fish, starfish, and stingrays. 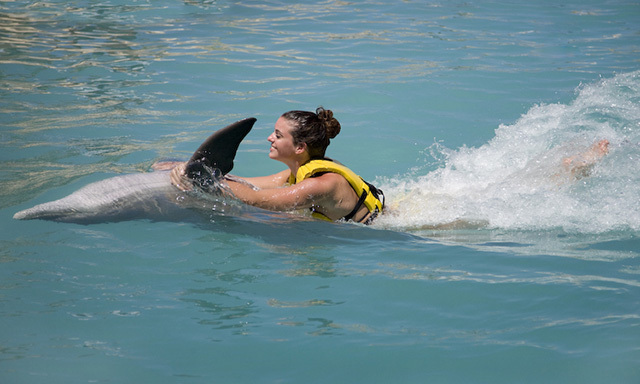 • Dolphin Swim: Splash alongside and ride on the belly of these friendly marine mammals with the supervision of professional trainers. • All-Inclusive Delights: Relax with a complimentary lunch buffet and unlimited beverages, including liquor, beer, and frozen tropical cocktails. • Aquatic Fun: Kayak or paddleboard across clear waters, or snorkel among fluttering fish and stingrays in a natural aquarium (weather permitting). • Guests must know how to swim to participate in this tour. • Family and friends not wishing to participate in the dolphin encounter may purchase an observer ticket onboard. This ticket includes unlimited food, beverages and water activities such as kayak and paddleboards. • Snorkeling, kayaking, and paddle boarding activities are offered at the site on a first come, first serve basis and are subject to cancellation due to weather conditions. There will be no refunds for optional activities in the event of weather cancellation. • Avoid alcohol before water activities. Guests must be of legal age to consume alcohol. • Guests must consider their physical fitness level and medical history when determining whether this tour is appropriate. Pregnant women and guests with back/neck problems should not select this tour. • Guests with cardiac conditions, asthma, diabetes, epilepsy, other heart or respiratory conditions or any other medical condition must take particular caution when selecting a tour with snorkeling/swimming elements, since such water activities could be subject to adverse sea conditions such as high winds, waves, and sea current. Guests who have concerns must consult with their personal physician before engaging in any activity that may be strenuous for them, particularly those involving snorkeling/swimming elements. • Personal photography or video during the dolphin encounters/swims is not permitted; however professional photos/ videos are available for purchase following your program.